Sanergy strives to leverage the entire sanitation value chain to create vibrant micro-businesses in informal settlements and by-products that can be marketed to Kenyan farmers. Hazardous waste is removed from local communities and converted into organic fertilizer and animal feed, for which there is high demand. However, experience has shown that all stakeholders need to derive benefit from each component of the business model to secure the community buy-in that is essential to the success of any local business. The idea for Sanergy originated at Massachusetts Institute of Technology (MIT) when stu- dents were asked to develop a business solution to a poverty challenge that affects at least one billion people around the globe. Ani Vallabhaneni, Lindsay Stradley and I decided to leverage our previous experiences to develop a systems-based solution to the urban sanitation crisis. 4.1 billion people lack access to basic sanitation facilities (Baum et al., 2013), resulting in one million deaths and USD 260 billion in lost productivity (World Bank, 2013) annually. Over one billion people currently live in urban slums, and this number is expected to double by 2030 (UN-Habitat, 2003). In Nairobi, 2.5 million slum dwellers rely on unsanitary practices such as “flying toilets”1 and pit latrines. Sanergy’s initial focus was on developing a dense network of payper-use toilets throughout Nai- robi’s informal settlements and collecting and converting the waste into organic fertilizer and biogas. However, our focus gradually shifted in two significant ways. First, we developed two additional distribution channels to reach a more diverse group of potential customers and to serve more customers based on their demands. In 2014 we began marketing toilets to landlords, who provide the facilities as a value-add service to tenants, and to schools. Second, we began expe- rimenting with other ways of processing waste, and we developed a high-protein, pathogen-free, insect-based animal feed. Since Sanergy’s inception in November 2011, our network has expanded rapidly. As of January 2016, we had removed and safely treated 7,590 tons of waste from the communities we serve. We have launched 781 Fresh Life Toilets run by 387 operators in eight informal settlements throughout Nairobi, and our network is used 31,700 times a day. Sanergy employs 251 people of whom 93% are Kenyan and 60% actually live in the slums. In an area with 40% unemployment, our Fresh Life Operators have created 147 additional toilet attendant jobs. For many of these people, this is the first formal employment they have ever had. We incentivize participation in the Sanergy model by developing ways to make it eco- nomically beneficial to do so. 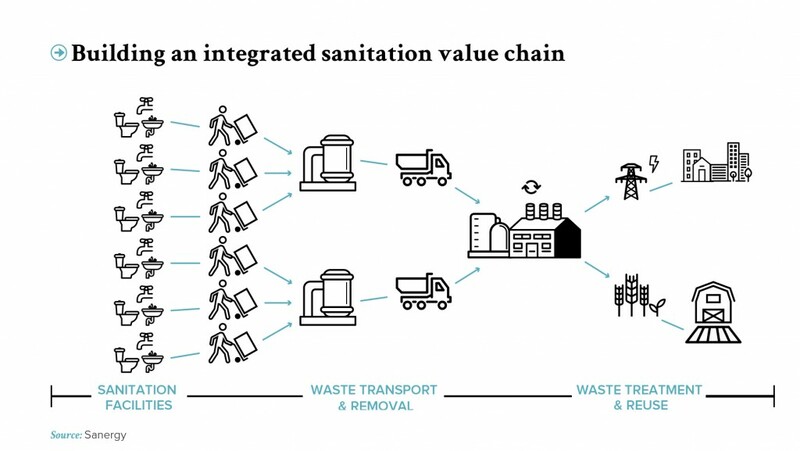 Sanergy leverages the entire sanitation value chain to make sanitation provision profitable — and thus sustainable (FIGURE). We currently have three main streams of revenue generation: the sale of sanitation units that we have designed and manufactured for around USD 500 a piece; waste collection services for non-Sanergy service providers, primarily for producers of food waste; and the sale of by-products derived from human waste, primarily organic fertilizer and insect-based animal feed. to earn an income while improving the health and well-being of their friends, family, and neighbors. As a social enterprise, we also strive to have maximum impact in the communities we serve, so we provide support services for our toilet franchisees and educate community members on the importance of good hygiene practices in general and hygienic sanitation in particular. In addition to improving community health, this increased hygiene awareness then creates more business for our franchise partners. 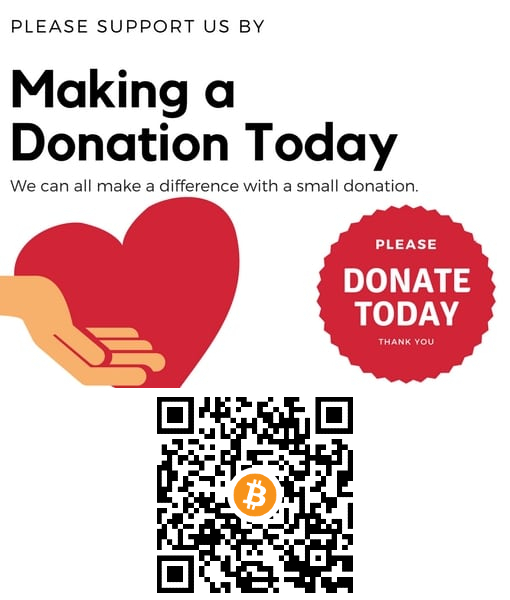 We have a unique hybrid structure, with a for-profit entity and a non-profit entity working in collaboration to achieve our mission. This structure has allowed us to diversify our funding sources, and we are able to work with an array of partners and funders to build healthy, prosperous communities. Most of our original funding came from competitions and other prizes, but we have robust and longstanding partnerships with a variety of investment funds, development agencies, and family foundations. We design and manufacture high-quality, low- cost sanitation units known as Fresh Life Toilets (FLTs) using locally sourced materials and labor. We liaise closely with community residents to ensure we are providing a service they are willing to pay for and that their ideas are incorporated into our designs. For example, we learned that community residents preferred completely tiled floors to a wooden frame around the squat plate and wanted mirrors and coat-hooks on toilet doors so we incorporated these features into the latest version of Fresh Life Toilets. Providing a service that residents are willing to pay for is crucial to addressing inadequate sanitation. Because our units use a cartridge-based collection system and have a small footprint (1 meter x 1.5 meter), they can be used anywhere. We use three distribution channels for our toilets. First, we sell franchises to local resi- dents known as Fresh Life Operators (FLOs) who run the toilets as a business, charging a nominal fee per use. These toilets are available to all and provide a clean hygienic alternative to public toilets and pit latrines. Operators set the price per use themselves based on what the market will bear (usually between 3 to 5 Kenyan shillings, on par with the cost of other sanitation options). In addition, we work with landlords to provide residents with access to safe sanitation within their compounds. Some have raised rents to pay for the FLTs but most have found that increased occupancy rates due to enhanced appeal more than cover the cost of the toilet. Finally, through partnerships with the Kenyan Ministry of Education, Oxfam, and WASH United inter alia we have developed a robust program covering hygiene awareness and the installation of FLTs in schools. Community buy-in is critical to our business model, and we ensure that our FLTs are viable businesses. FLOs can clear USD 1,000 in profit per toilet each year, and most own more than one toilet. Landlords have higher occupancy rates in plots with FLTs and schools with FLTs report higher enrollment rates (increases around 20%) and attendance rates, especially among adolescent girls who frequently drop out of school once they start menstruating, often due to inadequate sanitation facilities. We provide a variety of support services to our FLOs to ensure a consistent supply of quality sanitation facilities for customers and boost demand for our services. Receiving permission to access land is one of the biggest obstacles for FLOs. In informal settlements, both land ownership and planning permission are tricky issues. Sanergy’s government relations team helps potential FLOs to deal with these complex systems and secure access to land by identifying the relevant authorities and drafting convincing requests that increase the likelihood of getting approval. Through a partnership with Kiva2 we provide operators with 12- or 24-month interest-free loans to purchase toilets (which cost about USD 500 each). We require all new FLOs to attend business training where they learn relevant skills, including bookkeeping, toilet cleaning and customer service. We also host community marketing and edutainment events where we promote the Fresh Life brand and teach the importance of good hygiene. These events help drive demand for FLOs and hammer home the importance of hygiene in general. In 2013, we launched an initiative to diver- sify our product offering and help FLOs grow their businesses by selling consumer durables at their toilets. Based on extensive research, we selected three products (solar lamps, water filters, and cooking stoves) and were confident of success, but after a three-month trial only three cooking stoves had been sold. Our analysis revealed several flaws including product pricing strategy and payment plans, the reluctance of FLOs to up-sell to their customers and poor marketing of the new offerings. Ultimately however, the main lesson was that we should stick to our core business and what we know. Only about 10-15% of Nai- robi’s informal settlements have a functioning sewerage system so FLTs use innovative cartridges to store waste, ensuring that it does not harm the surrounding environment, and can be trans- ported easily and safely. Sanergy’s logistics team regularly visits each FLT to seal and remove the full cartridges, replacing them with clean, empty ones. The waste is then taken to our processing plant for treatment. Collecting and removing waste is a key com- ponent of our business success, since it provides the raw materials for our primary revenue source. As we have expanded our network of toilets, we have optimized the waste collection service and have begun marketing our waste collection services to other local establishments, primarily to collect food waste, which we use to create animal feed. Waste is converted into organic fertilizer known as Evergrow and an insect-based animal feed that we market to Kenyan farmers. This not only captures value from otherwise hazardous waste but also helps address agricultural challen- ges. The Kenyan Ministry of Agriculture has identified soil degradation as the primary threat to food security in the region and recommends that farmers spread 10 tons of organic fertilizer per hectare each planting season. With 27 mil- lion hectares of farmland in Kenya, there is a need for 270 million tons of organic fertilizer. Evergrow is one of the few products available to meet this enormous demand. We market our fertilizer to small- and medium- sized farmers both through suppliers and directly. We find that direct selling is most effective as we can then provide tailored support and explain how to get the most out of the product. One of the challenges we have had to overcome is the reluctance of farmers to change their current practices or adopt new ones. In response, we have developed a robust team of knowledgeable sales professionals who talk to farmers about the demonstrated benefits of using Evergrow, inclu- ding increased crop yields of between 30% and 100%. We also provide customer support services – primarily to smallholder farmers – covering sales advice, fertilizer application and follow-up. As a social enterprise, we leverage each component of our business model to ensure maxi- mum social impact and financial viability. It is vital to develop products and services that meet local needs, and the best way to do this is to involve potential customers in the design phase by conducting thorough market research. Moreover, by leveraging the entire value chain we have been able to incentivize participation and secure the community buy-in that is essential for success. Finally, we have realized the importance of diversifying our revenue streams to build multiple channels for community engagement and profitability (which we hope to achieve by 2018). Clogged, broken and unmaintained toilets are almost worse than no toilets at all. To keep the community engaged in the Sanergy solution, it is vital to have a profitable – and thus sustainable – solution that provides eve- ryone with hygienic, dignified sanitation over the long term. Flying toilets refer to the habit of defecating into plastic bags that are then tossed onto the street.